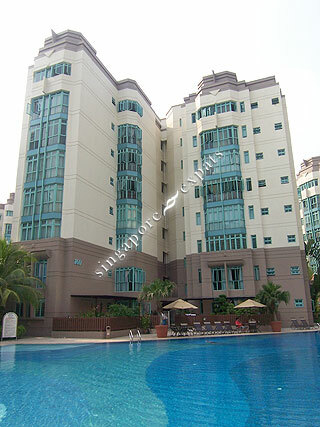 Ballota Park is a medium sized condo development located at Mariam Way, near to Changi Airport, the east side of Singapore. Ballota Park is accessible via the nearby expressways - Pan Island Expressway (PIE), Tampines Expressway (TPE) and East Coast Parkway (ECP). It takes only 5 minutes or less to commute to the Changi Airport. It takes about 5 minutes drive or bus ride to the nearest Tampines MRT station. Nearby amenities include Eastpoint Shopping Centre, White Sands, Tampines Mall, Century Square, The Japanese School Tanah Merah & Laguna Golf and Country Club. Condo pretty well maintained. Unit layout is functional with no wastage space. 4/5 bus stops way from Upper Changi MRT or Tampines East MRT. New commercial building, LIV@Changi is coming up soon. Facilities are dated. No water play for kids. Decent playground. The green window frame does not add value or beauty to the facade. Maybe most quiet condo in Sigapore. eg like tennis court flooring, function room and gates entrance need to units . Wonderful apartment if you are near the road otherwise it is a long walk inside. Pool is great, gym is good. Quite location with the charm of Changi.